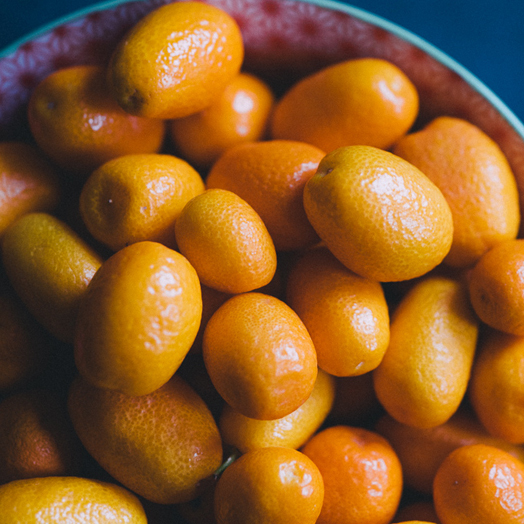 Kumquats are tangy and delicious citrus fruits that look like olive-sized oranges. Eating a tangy kumquat whole is a unique sensory experience. The flesh in the center is strikingly sour, but it is balanced by a surprisingly sweet and entirely edible peel. The flesh may contain a couple of seeds, which should be spit out due to their overpoweringly bitter flavor. Nagami (oval) kumquats are the most popular in the United States and are primarily grown in Florida. Meiwa kumquats were more recently imported from east Asia to the US and are slightly larger and not as tart. This aromatic fruit is rich in essential oils, antioxidants and fiber. Kumquats are also a great source of vitamin C: four fruits contain about 70% of your daily recommended allowance. Kumquats can be kept at room temperature for up to three days. They can last up to two weeks in the refrigerator, but should be returned to room temperature before eating. Kumquats are particularly cold hardy citrus. American kumquats are grown almost exclusively in California and Florida and can be harvested between December and May.